Discover a new angle with the newest non-surgical and non-invasive treatment that helps improve the contour and appearance of double chin. 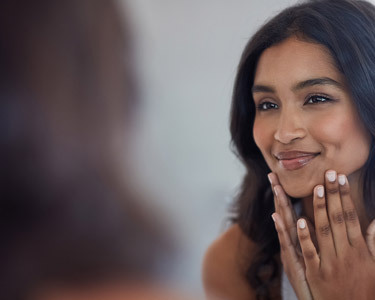 Small stubborn pockets of fat can form under the chin due to genetics, age, or other factors, resulting in a loss or lack of definition in a person’s chin profile that is resistant to diet and exercise. Our clinically proven non-surgical procedure is the first and only Health Canada approved injectable treatment for this area. Using deoxycholic acid—a naturally occurring substance found in the body—these injections destroy the membranes of fat cells, causing them to die. The body then processes and naturally eliminates these dead fat cells, helping to create a beautifully contoured profile. Our in-office treatment sessions take only about 15 to 20 minutes to complete. Together, you and your injector will determine the ideal treatment plan tailored to improve your particular chin profile. Your customized treatment will be administered into the fat under your chin using multiple injections. Based on your personal treatment goals, your injector will help to determine how many sessions are needed to achieve optimal results. Many patients experience noticeable results within 2 to 4 sessions. Most patients discover that future retreatment is unnecessary; once unwanted fat cells have been destroyed, they can no longer store or accumulate fat. To find out if this treatment option is right for you and to learn more about its cost, fill out the request for information on the right. You can also contact us by email at info@theplasticsurgeryclinic.com to learn more or to schedule a free consultation.